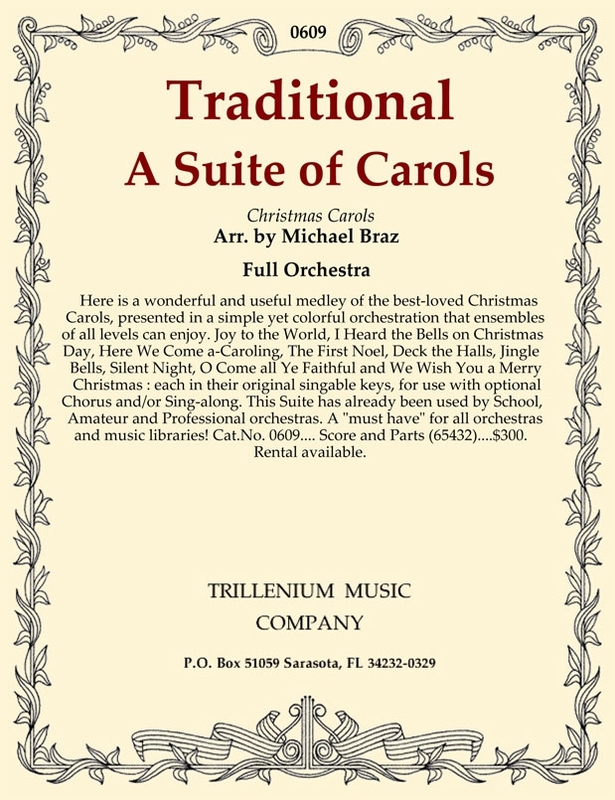 Description Here is a wonderful and useful medley of the best-loved Christmas Carols, presented in a simple yet colorful orchestration that ensembles of all levels can enjoy. Joy to the World, I Heard the Bells on Christmas Day, Here We Come a-Caroling, The First Noel, Deck the Halls, Jingle Bells, Silent Night, O Come all Ye Faithful and We Wish You a Merry Christmas : each in their original singable keys, for use with optional Chorus and/or Sing-along. This Suite has already been used by School, Amateur and Professional orchestras. A "must have" for all orchestras and music libraries! Cat.No. 0609.... Score and Parts (65432)....$300. Rental available.